Joints are divided into three classes : fibrous joints, cartilaginous joints, and synovial joints. Fibrous joints are articulations in which the surfaces of the bones are fastened together by intervening fibrous tissue, and in which there is no appreciable motion, as in the joints between the bones of the cranium. There are two principal groups of fibrous joints : sutures and syndesmoses. Sutures, however, can be subdivided into seven different varieties. A suture is an articulation met with only in the skull, where the margins of the bones articulate with one another (fig. 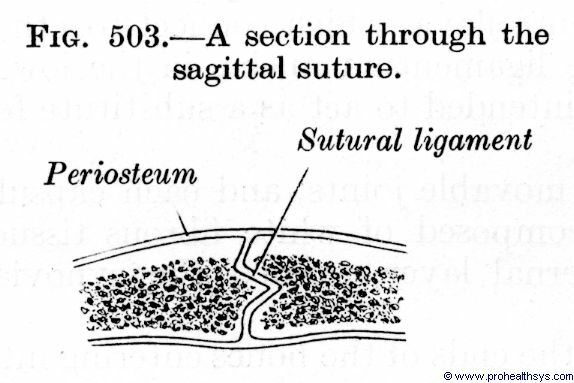 503), but are separated by a thin layer of fibrous tissue, which is named the sutural ligament and is continuous externally with the pericranium, internally with the fibrous layer of the dura mater. When the bony margins are provided with saw-like edges the articulation is named sutura serrata, as in the sagittal suture. When the margins present a series of tooth-like processes which widen towards their free ends, the articulation is named a denticulate suture. Where one bone overlaps another, as in the suture between the temporal and parietal bones, it is named sutures squamosa; where the overlapping edges are ridged or serrated it is named sutura limbosa; where there is simple apposition of contiguous rough surfaces, as between the palatine processes of the maxillae, or between the horizontal plates of the palatine bones, it is named sutura plana. A gomphosis or peg-and-socket suture is articulation by the insertion of a conical process into a socket; it is seen in the articulations of the roots of the teeth with the alveoli of the mandible and maxillae. A schindylesis or wedge-and-groove suture is an articulation where a ridge gets into a grooved surface; it is seen in the articulation between the rostrum of the sphenoid and the upper border of the vomer. Syndesmosis is an articulation in which the opposed bony surfaces are connected by an interosseous ligament; as in the inferior tibiofibular joint. In these articulations the opposed bony surfaces are connected to each other by cartilage, and a limited amount of movement may be possible. There are two varieties of cartilaginous joints, viz. primary and secondary. Primary cartilaginous joint.- This is usually a temporary form of joint, for the connecting cartilage is, in most cases, ultimately converted into bone. Primary cartilaginous joints are found between the epiphyses and diaphyses of long bones, between the occipital and sphenoid bones at and for some years after birth, and between the petrous parts of the temporal bones and the jugular processes of the occipital bone. No movement is permitted at these joints. Secondary cartilaginous joint.-In this joint the opposed bony surfaces are covered with hyaline cartilage, and are connected to each other by a flattened disc of fibrocartilage of a more or less complex structure (fig. 505). The bones are also connected by ligaments, which, however, do not form a complete capsule round the joint. A limited degree of movement is permitted. 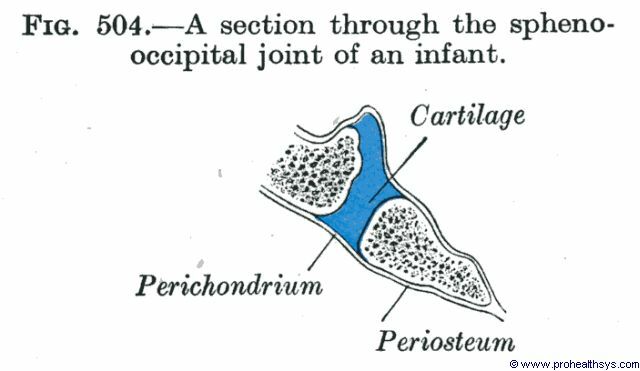 Secondary cartilaginous joints are represented by the joints between the vertebral bodies, the joint between the manubrium and the body of the sternum, and the joint between the pubic bones. All these articulations lie in the median plane of the body. Most of the joints of the body, including all the joints of both limbs, with the exception of the inferior tibiofibular syndesmosis and the pubic symphysis, belong to the synovial group. They have certain definitely characteristic features. (1) The contiguous bony surfaces are covered with articular cartilage and are not attached to one another. (2) There is a joint cavity, which is reduced to a potential space in the normal healthy condition during life. 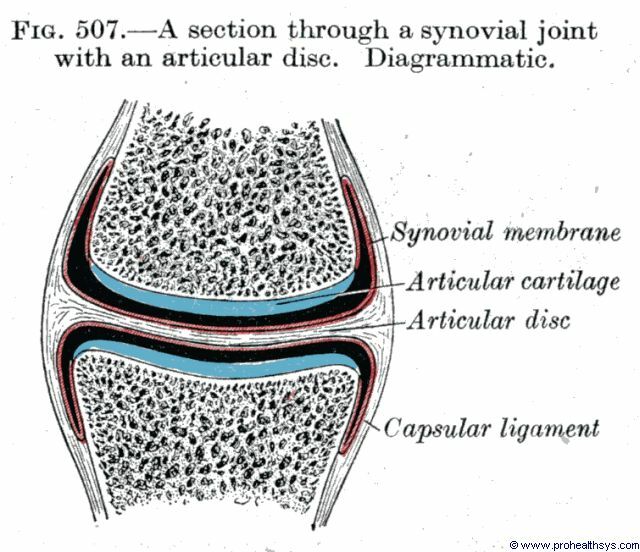 (3) The joint is completely surrounded by an articular capsule, which consists of a capsular ligament lined with a synovial membrane. 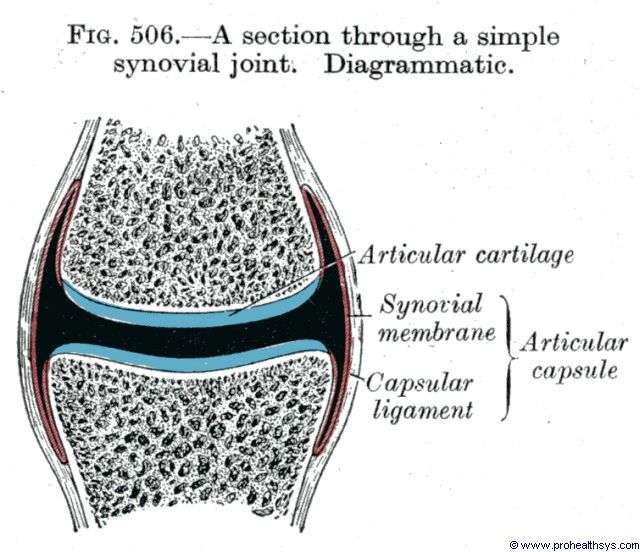 (4) The synovial membrane lines the whole of the interior of the joint with the exception of the cartilage-covered ends of the articulating bones. (5) Additional, extracapsular, ligaments are usually present. (6) On account of the nature of the connections between the bones concerned, movement is always possible in a synovial joint: it may vary from a simple gliding movement, very limited in range, such as is permitted between the individual bones of the carpus, to the wide range of movement of the shoulder-joint. In addition, the joint-cavity may be divided, completely or incompletely, by an articular disc of fibrocartilage (fig. 507), These structures act as shock reducing agents and they serve to ensure perfect contact between the moving surfaces in any position of the joint (see below). The periphery of articular discs is continuous with the capsular ligament of the joint, while their free surfaces are covered with synovial membrane, unless they are subjected to pressure, as in the knee-joint. Synovial joints are classified according to the kind of motion permitted in them. There are two varieties in which the movement is uniaxial; that is to say, all movements take place around one axis. In one, the ginglymus or hinge joint, this axis is, practically speaking, transverse; in the other, the articulatio trochoidea or pivot joint, it is longitudinal. There are two varieties where the movement is bi-axial; these are the articulatio condyloidea or condyloid joint and the articulatio sellaris or saddle-joint. There is one form where the movement is poly-axial, the articulatiocotylica or ball-and-socket joint; and finally there is the articulatio plana or plane joint. In uni-axial and poly-axial joints it is not difficult, from the mechanical point of view, to ensure that the opposed articular surfaces shall make perfect contact in all positions of the joint, but the same object is by no means easy to attain in biaxial joints, where movements are possible around two axes, which are at right angles to each other. In many situations this difficulty is overcome by the provision of articular discs. The opposite surfaces of a disc do not correspond to each other, but each is accurately adapted to the bone with which it is in contact. When movement occurs round one of the two axes, the disc remains stationary relative to one of the bones but moves with it over the other; when movement occurs round the other axis, the disc remains stationary relative to the opposite bone and moves with it. For example, when the sternal end of the clavicle is elevated or depressed, the clavicle moves over the clavicular surface of the articular disc of the joint, but when the bone is moved forwards or backwards, the disc remains stationary relative to the clavicle and moves with it over the clavicular notch of the manubrium sterni. This arrangement ensures perfect contact between the bones and the disc in all positions of the joint, and in this sense, the discs may be said to adapt the opposed articular surfaces to each other. Ginglymus or hinge-joint—In this form the articular surfaces are molded to each other in such a manner as to permit motion in one plane only. On each side of the articular surfaces the bones are connected together by strong collateral ligaments, which form their chief bond of union. The best examples of hinge-joints are the interphalangeal joints, and the joint between the humerus and ulna. Articulatio trochoidea or pivot-joint. —Where the movement is limited to rotation, the joint is formed by a pivot turning within a ring, or a ring turning on a pivot, the ring being formed partly of bone, partly of ligament. In the superior radio-ulnar joint, the ring is formed by the radial notch of the ulna and the annular ligament; here, the head of the radius rotates within the ring. In the articulation of the odontoid process (dens) of the axis with the atlas, the ring is formed, in front by the anterior arch, and behind by the transverse ligament, of the atlas; here, the ring rotates round the odontoid process. Condyloid articulation.-In this form of joint, an ovoid, convex, articular surface, or condyle, is received into an elliptical concavity in such a manner as to permit of flexion, extension, adduction; abduction and cireumduction, but no axial rotation. The radiocarpal joint is an example of this form of articulation. Saddle-articulation.-In this variety the opposing surfaces are reciprocally concavoconvex, and the movements are the same as in the preceding form. The best example of the saddle-articulation is the carpometacarpal joint of the thumb. Articulatio cotylica or ball-and-socket joint. In this type of joint the distal bone is capable of motion around an indefinite number of axes, which have one common center. It is formed by the reception of a globular head into a cup-.like cavity, hence the name ‘ball-and-socket.’ Examples of this form of articulation are found in the hip- and shoulder-joints. A plane joint is one which admits of gliding movement only; it is formed by the apposition of plane, or nearly plane, surfaces, the amount of motion in such joints being limited by the ligaments or osseous processes surrounding the articulations. It is seen in the joints between the articular processes of the vertebrae, and in most of the carpal and tarsal joints.